This is an easy recipe but needs time and patience because it involves the magic of slow cooking. Mutton or goat meat is my favourite meat and I usually cook it Bengali style. Considering the sheer variety of spices and masala blends I have in my pantry thanks to wonderful friends, not just local but from all around the world, I do also play with other flavours. 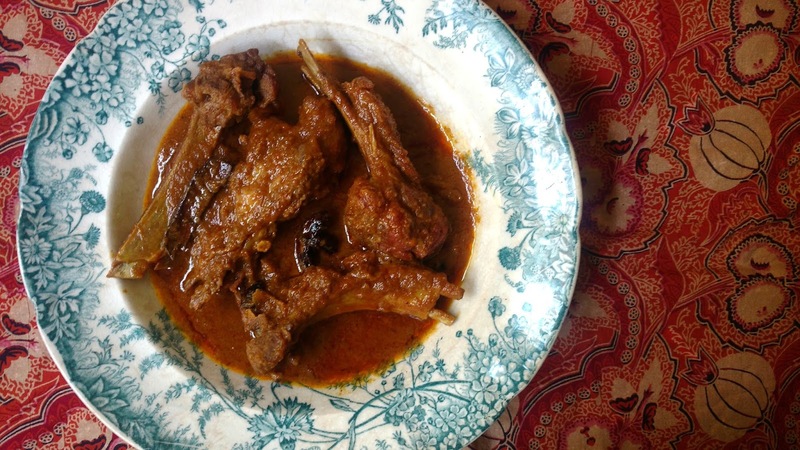 My friend Smita gave me a bottle of her home made Kolhapuri masala and the obvious thing to cook with was mutton. So I used my basic go to recipe/technique for cooking mutton and tweaked it to use the Kolhapuri masala. Instead of the standard curry to be eaten with rice I made chops in a rich thick gravy that will be perfect with pao. Marinate the chops with the curd, powdered spices, salt, ginger garlic paste, and a splash of mustard oil for a few hours or over night. Make a paste with the onions, green chillies, and garlic. Heat some mustard oil in a heavy based cooking pot till it's nice and hot. Drop in the whole spices and let them fry for half a minute. , reduce the heat, and then fry the paste slowly for 8 to 10 minutes till it turns slightly brown and has lost all its moisture. Don't burn the paste! Add the marinated chops and mix well to coat all the chops with the paste and spices. Cook this covered on slow heat for another 10 minutes stirring every couple of minutes so you don't burn anything and all the meat is broiled. Add a cup and a half of water to the pot, stir everything well, bring to a boil, and now cook slowly on low heat till the chops are cooked to perfection. Be sure to leave the lid on while cooking. Just stir once every 5-7 minutes to ensure even cooking. You should have a thick silky gravy that clings to those chops when it's all cooked. Garnish with washed and finely chopped fresh coriander if you like. Serve with fresh pao from your local bakery or with any bread that you like.